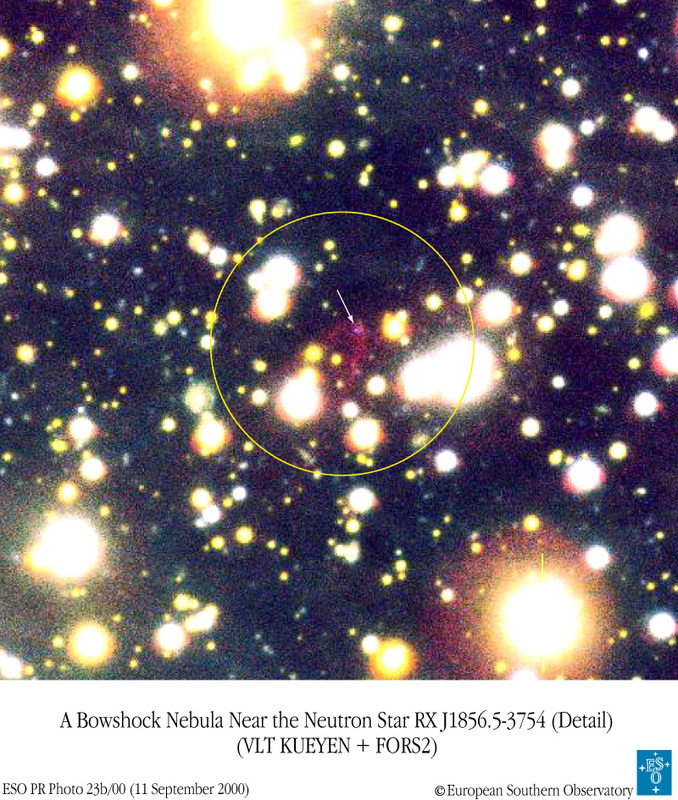 Explanation: The lonely RX J1856.5-3754 was formed from the collapsed core of an exploding star. At a distance of 180 light-years it is the closest known neutron star. More massive than the Sun but only 20 kilometres across, this tiny stellar juggernaut plows through the hydrogen gas and dust clouds of interstellar space at about 200 kilometres per second. The surface of the neutron star is fantastically hot, around 700,000 degrees Celsius, making it detectable with orbiting x-ray telescopes. 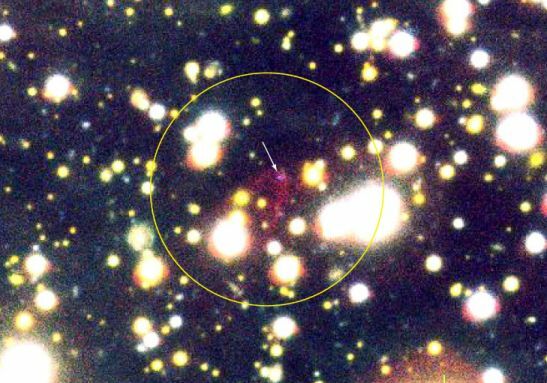 But optical astronomers were surprised to discover that RX J1856.5-3754 is also surrounded by a cone-shaped nebula. Indicated in this deep image from the European Southern Observatory's Kueyen telescope, the nebula glows in the red light of ionized hydrogen atoms recombining with electrons. Its cone shape is analogous to the bow wave of a ship ploughing through water. A faint blue dot near the tip of the cone is the neutron star itself. The nebula appears to have formed very near the surface of the neutron star and astronomers are trying to determine if the observed densities and temperatures can explain the nebula's appearance.